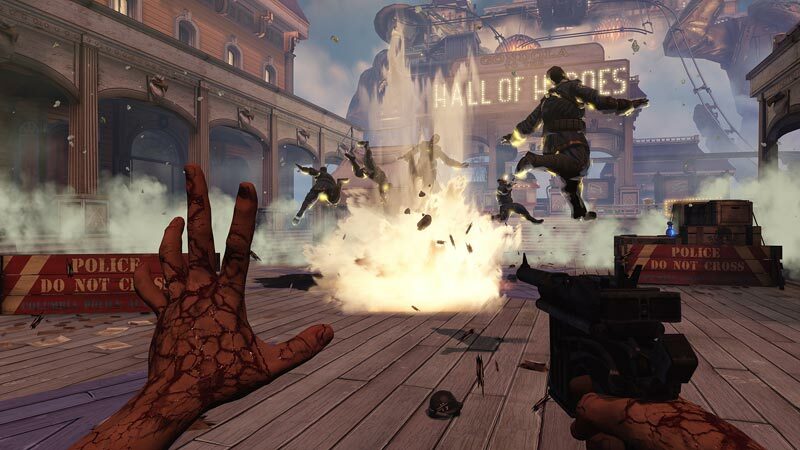 BioShock Infinite is a sublime shooter set in a magical world. While the campaign’s final third never quite lives up to its breathtaking opening, there’s more than enough intrigue imprisoned within Columbia’s curious suspended districts to keep you compelled from the beginning right through to the very end. BioShock Infinite didn't have the same impact on me as the original BioShock. That is, perhaps, to be expected for a sequel--especially a sequel that stands nearly completely on its own. However, BioShock Infinite is one of the only truly complete gaming experiences. It hits every beat just right and left me actually caring about the characters, intrigued by the mysterious city, and perplexed by the convoluted story. While the end of 2013 will be filled with talk about a new generation of video games, BioShock Infinite's narrative will stand out as an achievement, helping put a cap on a generation that propelled narrative as a focus for the industry. Undoubtedly the finest game crafted by Irrational Games, BioShock Infinite is one of the best told stories of this generation. It simply cannot be missed. 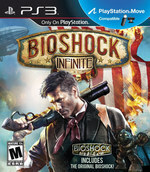 BioShock Infinite is a game that has received a lot of hype. With our review publishing after the majority of other reviews had already given it a perfect score, I went into the game looking for the negatives. I wanted to find something wrong, some annoyance, or anything to not buy into the hype. Truth be told, the negatives are not to be found, or if they are, they are so minor that they do not at all mar the finish of the rest of the game. 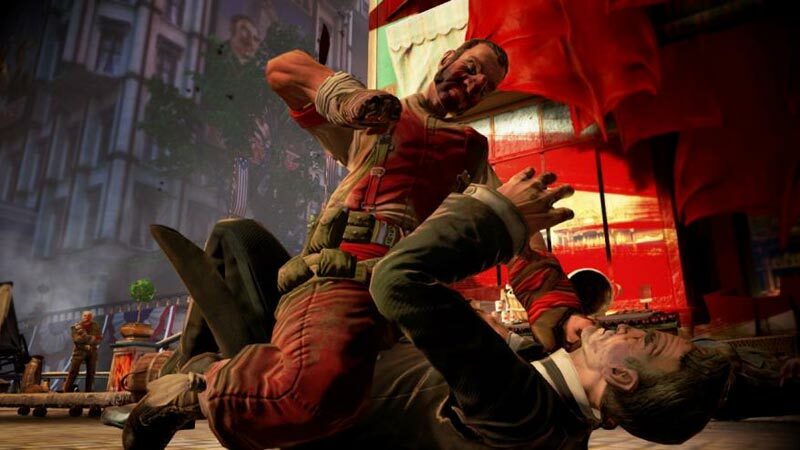 BioShock Infinite could make you feel uncomfortable. If you adhere to religious faith, or celebrate American idealism, this game may invite introspection or even anger. 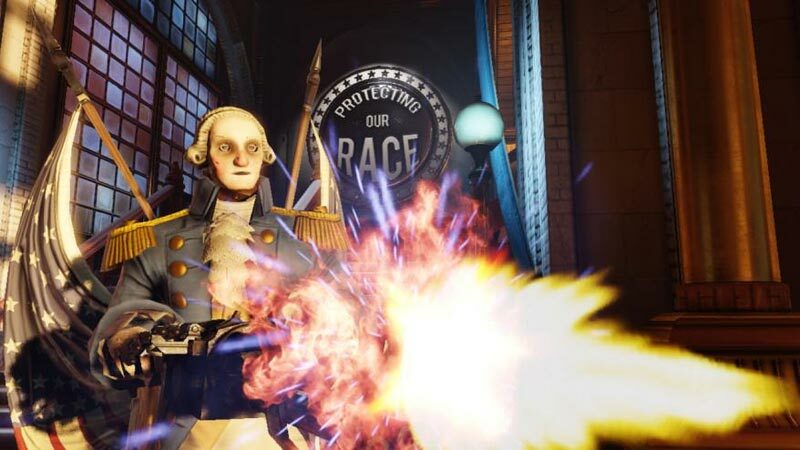 BioShock Infinite isn't afraid to magnify the way religious and racial extremism inform our culture and change lives. It isn't afraid to depict a less-than-holy trinity diseased by power, deception, and manipulation. Infinite is more than a new setting, story, and characters; those elements are seamlessly integrated with complex themes, a mysterious plot, and entertaining combat to create an amazing experience from beginning to end. Familiar threads run through it – a lighthouse, a strange city, a charismatic antagonist – but they are homages to the past rather than attempts to recycle it. At the end of the day, Ken Levine and the crew at Irrational Games have crafted an amazing journey through a fantastic city with two of the most compelling characters gaming has seen in a long while. We've waited for what seems like forever, but now that Infinite's finally flying across the gaming stratosphere, we're free to come along for the ride. Columbia may not really be heaven, but it's the closest we've come in a while. In total, BioShock Infinite is a brilliant shooter that nudges the entire genre forward with innovations in both storytelling and gameplay. It trips over itself in a couple of spots, but not in any way that should keep you from embracing it with your utmost enthusiasm. All in all, Infinite’s story plays its cards very well throughout and there’s a few clever surprises along the way. The backstory of Columbia is also fleshed out by Voxophones – audio recordings which you can find with a little bit of exploring – these are extremely interesting and tie everything together without the need of it getting in the way of the plot at hand. The graphics are wonderful, the atmosphere great, soundtrack superb. The action is amazing, the story affecting. I've tried damn hard, but I couldn't find anything to dismiss during my time twice-through with the game. Irrational Games have created a masterpiece. BioShock Infinite sólo tiene un problema: que tiene que luchar contra sí mismo. Mientras jugamos, resulta inevitable compararlo con el original. Y el primer BioShock es uno de los grandes de esta generación... ¿Aguanta Infinite esta comparación? En nuestra opinión, sí. Es cierto que no sorprende tanto como aquél, pero está todo tan cuidado y tan bien diseñado y sus combates son tan divertidos gracias a sus múltiples opciones que es imposible resistirse a descubrir los misterios que encierra. Un fantástico e imaginativo juego de acción que recoge a la perfección el legado de Bioshock y logra mejorarlo en diversos apartados. 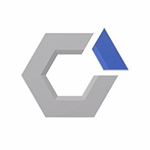 La recreación de la ciudad de Columbia es absolutamente magistral, una enorme combinación entre visión, tecnología y talento artístico que nos permite explorar uno de los mejores entornos virtuales de esta generación. La acción es intensa, variada y nunca llega a cansar, puede que sea algo más reminiscente de la de Bioshock de lo que hubiera sido deseable, pero también funciona mejor. Cuando Ken Levine habla, la industria del videojuego escucha. El prestigioso creativo ha querido centrarse en esta ocasión en la historia, y el resultado logrado ha sido asombroso. 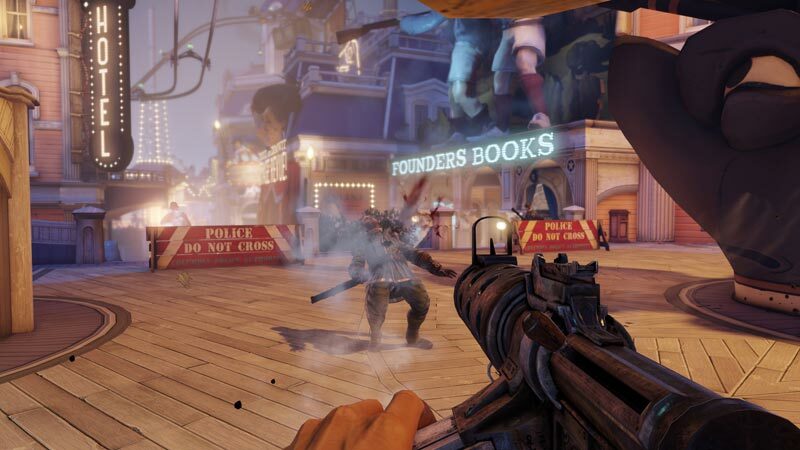 Sin descuidar la perspectiva jugable, el nuevo Bioshock se erige como uno de los grandes shooters de los últimos años. Infinite logra, con estos puntales, ser uno de esos escasos lanzamientos que cada temporada logran ser imprescindibles. Nein, BioShock braucht die eine überraschende Wendung nicht mehr, weil Infinite von einer ebenso packenden wie vielschichtigen Erzählung lebt. Spielemacher Ken Levine vereint große Themen wie Schuld, Sühne und Rassismus und erschafft eindrucksvolle Charaktere, die lange im Gedächtnis bleiben – allen voran Elizabeth, die ebenso charmant wie gefährlich ist. Ihr dynamisches Verhalten ist beeindruckend, wenn sie Booker beim Suchen unterstützt, ihm Munition zuwirft sowie Zugang zu Geschützen oder Deckung ermöglicht. A la fois plus et moins qu'un shooter, BioShock Infinite accroche et fascine tout en offrant une vision d'une rare intelligence, sans concession, sans manichéisme primaire, le tout serti dans un magnifique écrin. Bref, une chose est sûre, ceux qui s'envoleront pour Columbia ne sont pas près de remettre les pieds sur terre. Avouez que ce serait cocasse... En tout cas une chose est sûre, ce DLC est absolument indispensable pour tous les fans de BioShock Infinite et, paradoxalement, encore plus pour ceux du BioShock originel. 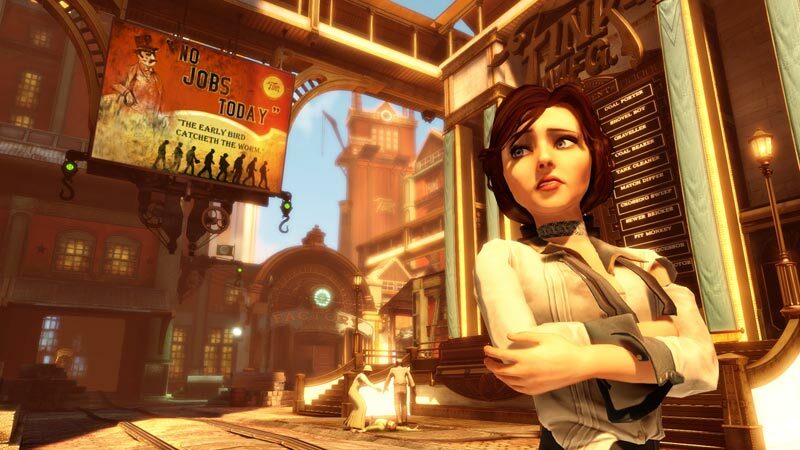 Comme un terrible écho aux récents déboires du studio Irrational Games, la saga trouve ici une véritable conclusion, et nous laisse l'impression d'un travail pleinement accompli, achevé, et cohérent. Un bien beau baroud d'honneur ! De manier waarop het verhaal in BioShock Infinite wordt verteld is in ieder geval beter dan in het origineel. Het verrassingselement dat de eerste BioShock had is niet meer te herhalen en vooral in dat opzicht is Infinite dus de betere game. Het is een ervaring die iedere gamer meegemaakt moet hebben en aan het einde zul je net als ons met open mond naar je beeldscherm zitten staren, onder de indruk van dit meesterwerk van Irrational Games.